Customizing Transactions in the Inventory module is a practice that most organizations follow to map the realities of their business processes. 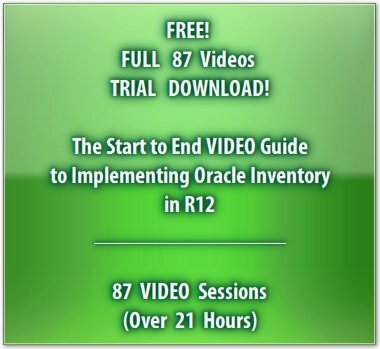 This is an optional step in the implementation of Oracle Inventory. But, before we get there let us stop a while and reflect on what we learnt in the section on Miscellaneous Transactions. We intend to cover the costing implication of transactions in the section on Cost Management. Turning back to customizing transactions, why do we need to customize a transaction? Well, to begin with organizations may and often do have a need to use their own terminology to name specific transactions. By the same logic, they can create unlimited number of transactions to record material movement. A Transaction Source Type and a Transaction Action come together to form aTransaction Type. A Transaction Action is a system defined action that represents some material movement or a cost update. Used in conjunction with a Transaction Source Type, a Transaction Action defines a Transaction Type. Finally, a Transaction Type is used to classify a particular transaction for reporting and querying purposes. Transaction types are also used by Oracle Inventory to identify certain transactions to include in historical usage calculations for ABC analysis or forecasting. Oracle Inventory comes seeded with a number of transaction types. User-defined transaction types can be created by combining transaction source types with transaction actions. The Office Smart Naperville (OSN) plant has a policy of inspecting items in stores. There is a regular inspection for items being received from suppliers. But in some cases where a supplier has a good record with the quality control department at OSN, inspections are no longer conducted for inbound consignments. However, to ensure that such “uninspected” material continues to adhere to OSN quality standards, periodic inspections are conducted on material stocked in the Stores subinventory. If an item is found to be defective, it needs to be transferred to a bond area pending further investigation. Jennifer has defined this bond area as a subinventory called MRB – an acronym for Material Review Board. Travis the Inventory Management track lead at Office Smart Solutions wants a specific transaction type that would be used only for transferring rejected material from Stores to MRB. He wants to monitor the volume of material moved under this transaction type to help quality personnel evaluate supplier performance at a later stage. Travis explains his situation to Jennifer. Can this be done? Jennifer runs through her mind what she just heard. The next section deals with Jennifer's solution.